Welcome to 502 North Apartment Homes! 502 North is nestled in the heart of North Austin, just minutes away from premium outlet shopping, major employers and exclusive dining. Enjoy the sparkling resort style pool or BBQ with your friends and family at the onsite grills and picnic areas. This pet-friendly community also offers upgraded apartment homes with new lighting, flooring and appliances. Our 24-hour maintenance service and Professional onsite management team is here to ensure that you will receive top of the line customer service. We offer package acceptance, on line services such as on-line rent payments and much! Submit your service requests on line 24 hours a day and even renew your lease on-line at your convenience through our user-friendly resident portal. 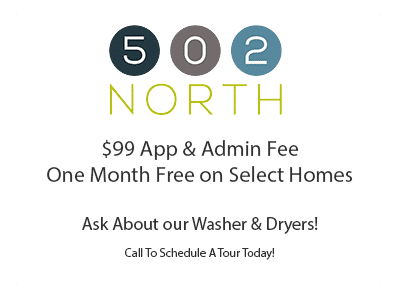 Call us today to schedule a tour of your new home at 502 North Apartment Homes!